I believe that the entry that you talked about as currently getting the top page views is the idea for vehicle blind spot detection. I am an engineer for a very large corporation with a huge engineering/design network. 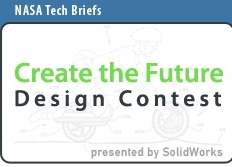 I have been telling my colleagues about the NASA Tech Briefs Create the Future Design Contest and its website. There appears to be a lot of interest here and many discussions of possible inventions to add to the contest. You have done such a great job of explaining the contest (better than I have been doing) that from now on I will refer my colleagues to your blog. From there they can link to the Create the Future Design Contest website as they please. You may be seeing a lot more entries soon. How are the entries policed concerning the rules? I know that the contest folks are very very busy. But golly gee, a simple Google search shows entries that have won previous awards and have been shown to the public. This is a good question -- I don't believe the entries are currently being checked by hand for previous exposure, but I'll pass this on to the NTB staff as a suggestion for the pre-judging review phase. They may plan to do that anyway. If you have specific ones in mind, please drop the admin staff a note on the Contest Site and they'll follow up.